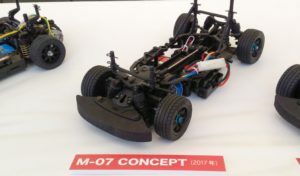 Model maker familiar with the star mark · Tamiya Co., Ltd. announces the latest model “M – 07 CONCEPT chassis kit” of the popular category “M chassis” series of 1/10 electric RC (car control) car series to June 20, 2017 Release on the day. 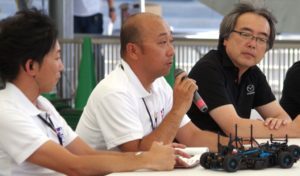 Prior to this, Le Boran Boost Editorial Participated in “Tamiya Media Meeting M-07 CONCEPT New Product Presentation & MAZDA Championship Race Experience Meeting” held on June 16, 2017. This time, in addition to the development staff of Tamiya, we will send a pattern of M – 07 CONCEPT new product briefing, which was held with guests from Mazda Co. together. 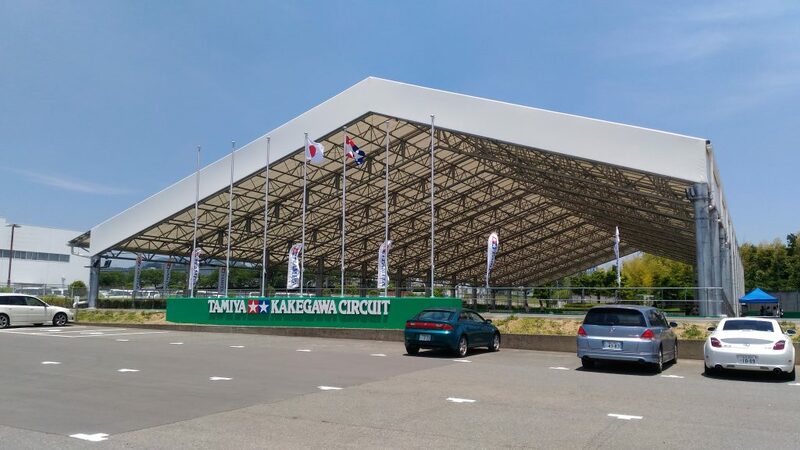 The stage of this media meeting was set up in 1996 as the second sacred place of Tamiya RC car fan following “Tamiya Circuit” in Shizuoka City, with the 20th anniversary of last May as a covered The world’s largest all-weather RC car circuit “Tamiya Kakegawa Circuit” renewed. M – 07 CONCEPT In the new product briefing, Mr. Seiwa Suzuki of the Tamiya Planning & Development Department, Mr. Sumi Sumiyuki of the sales department, Mr. Koji Noma, former director of the product headquarters and general manager of Demio, from Mazda, Mr. Masaaki Nakayama, Product Headquarters Roadster Chief and Chief Designer, participated as a guest. Appeared in 1991, the 1/10 “Touring Car” series that has made numerous domestic and international popular sports cars and GT racing cars appear as RC cars. Stylish body and powerful driving unique to large size boasts high popularity from that time, and now it is a standard style of Tamiya’s electric R / C car. “M chassis” was born in 1994 to commercialize small cars that can not be modeled in such a touring car chassis with RC cars. 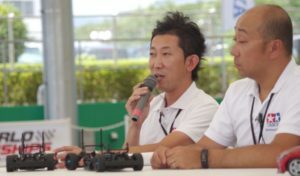 Mr. Suzuki (photo left) and Mr. Maezumi (photo right), which are also members of TRF (Tamiya Racing Factory) which is the work team of Tamiya. 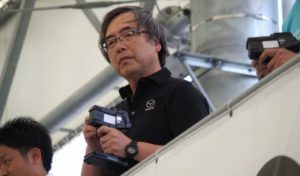 He is active in a wide range of activities, including fighting competitive race scenes held both in Japan and abroad, and actively providing user support and setting advice at race events such as the Tamiya Grand Prix held in various places. 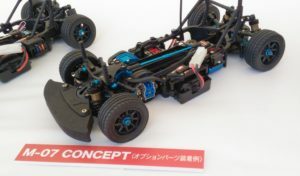 Unlike the “touring car”, which has many core fans who like Tamiya RC cars that are the root of Tamiya, “M chassis” is the center of the user who started to be drawn by the outstanding looks and loveness, Tamiya’s Even in the official race, it has been loved for many years as a class that many people say “I want to enjoy racing” rather than compete with eyes triangle. Each model of the “M chassis” of the succession had a relation with the cost, making low cost car making priority on ease of making was done. Also, as mentioned above, there are not so many race-oriented users, so driving performance is not pursued as much as a touring car, suspension design geometry and simplified damper In a certain sense, such as “equipped with equipment for enjoying so – so -” running was not given. Spinning or undoing is natural as long as you roll off with a rough start when you thrust into the corner at high speed, and the user loved “M chassis” including even such a part. This may be partly in common with the psychology of those who love small cars in real cars. 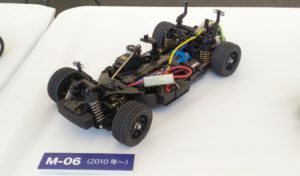 However, in recent years, participants in the “M chassis” class of the Tamiya Grand Prix are increasingly racing-oriented core audiences who have raced with touring cars, and in the opposite direction RC car racing is the first time for beginner drivers It is said. The situation where people of various levels participate in the category of “M chassis” is pleasing, while many users burn hands to the chassis which is difficult to run against the cute appearance, many people who can run well with the same cars and who can not run well It is said that the disparity of it increased. 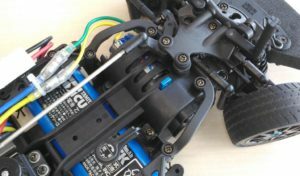 In order to solve such a situation, the development of a new “M chassis” which enables people of all levels to run easily in the same way, from beginners to experts, became an urgent task. 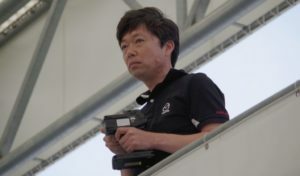 Mr. Maezashi who supports users with Tamiya Grand Prix in various places also said that he heard a lot of similar stories on the scene, and “Newly developed chassis” reflects the ease of maneuverability and the setting that the user advised to the user properly It is said that the height of “reproducibility” to be added is added to the request. Back in this way About 1 year ago, the development of M – 07 CONCEPT started. 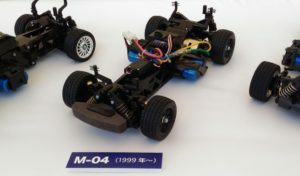 M – 07 The most significant change in CONCEPT is the structure of the chassis (frame). M-07 CONCEPT in the middle of assembly. I can understand the structure of the chassis in which even the gear box is integrated. Each model of “M chassis” so far adopted a split monocoque frame. This is because all three successive models except M – 04 made it possible to change the wheelbase in three stages, replacing or rearranging the frame, adding a separate part to be a spacer to the split part ” It was supposed to be extended. 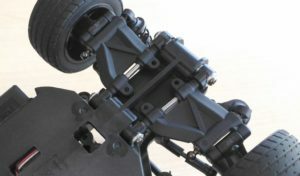 The chassis frame of the M – 03 chassis was designed to easily extend the wheel base by attaching separate parts for extension (black parts on the right of the photo) to the divided parts. However, making the mainframe into a divided structure has numerous adverse effects on the running of the car. 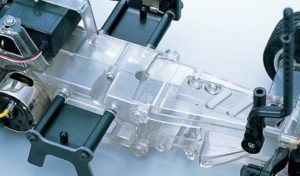 In particular, the influence on the chassis rigidity is great, and in order to secure its rigidity, polycarbonate resin with high strength was adopted as the frame material of the successive “M chassis”, but adverse effects on the chassis rigidity can not be completely wiped out It is said. 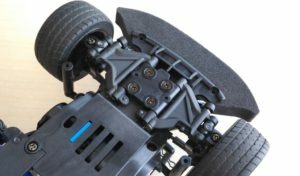 The hard frame also had a bad influence on the characteristics unique to the RC car that gains grip by twisting the chassis, resulting in narrower chassis characteristics of capacity. In addition, the chassis with a narrow capacity had a big influence on the determination of the geometry of the suspension, and in the succession “M chassis” it was necessary to set the suspension geometry so that the understeer became a strong handling. 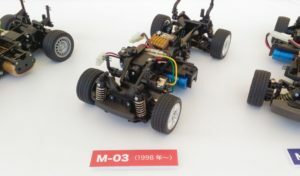 On the day, in addition to the successive chassis from M – 01 to M – 07 CONCEPT, M – 07 CONCEPT of full option specification incorporating “Hop Up Options” which is genuine optional part of Tamiya was also exhibited, and the difference in the structure of each car I was able to confirm. 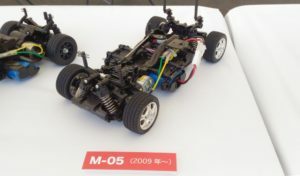 Therefore, M – 07 CONCEPT redesigned the structure of the chassis. Also adopted as a “M chassis” series for the first time a single-piece frame with even a gearbox integrated, secured high chassis rigidity by combining with the front stiffener. 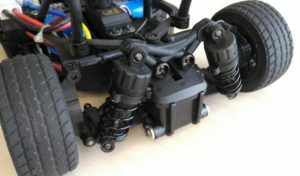 The chassis rigidity is structurally secured by adding the left and right stiffener (photo right) attached as separate parts to the main chassis (front left) where the front gearbox to the rear end are integrated. As a result, the change of the wheelbase has changed from the previous three stages to two stages, but because it became a softer material, the grip due to the torsional rigidity of the frame can be greatly earned, the capacity of the car leap It is said that it expanded in the same way. The suspension that the basic geometry hardly changed for almost 20 years, although there were some minor changes each time of model change, was greatly improved in the M – 07 CONCEPT which gained a chassis with high rigidity. Front and rear suspension arms of a completely different design than before. 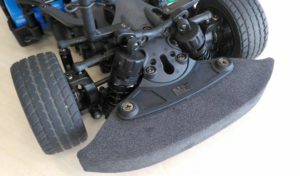 Besides providing a function that can adjust the rebound stroke both in the front and the rear, equipment like the touring car is made, such as being able to easily change the rear toe angle. All newly designed suspension arms adopt the long span type which has already become commonplace in high-end touring cars, ensuring high grip. The double wishbone type suspension is equipped with four independent oil dampers as standard equipment. It is easy to change the setting using internal oil or sold separately sold coil spring. Oil damper which was option setting up to now was also equipped as standard, and its installation position has been redesigned greatly. Especially the front geometry improved greatly thanks to the increased capacity of the chassis. “It turns” more, given the aggressive geometry, fast cornering and manoeuvrability were said to be compatible. Also, the point that the differences in the handling characteristics due to the difference in the wheelbase which was large until now has been reduced is also a point. It said that this made it easier to chose your favorite body without worrying about the difference in running. 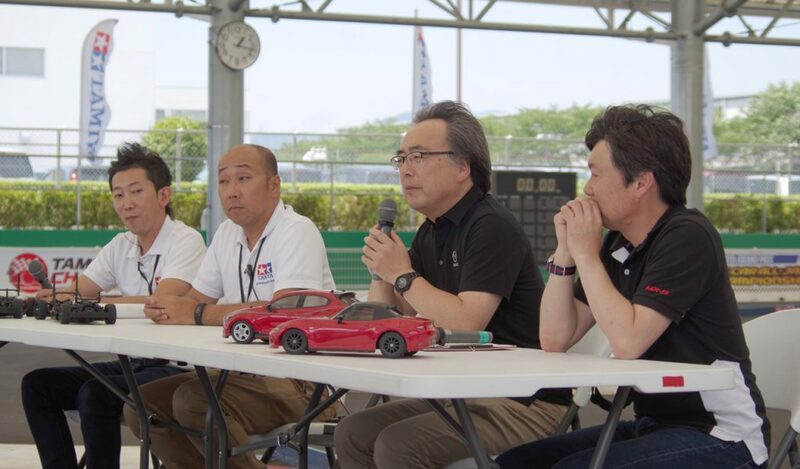 In addition to the title of the head of the product headquarters, Ms. Noma (left of the photo) who is also representative of Mazda’s internal club, “MRF = Mazda, RC car · fan club”. He likes large models, and he is well versed in Tamiya RC cars including “M chassis”. 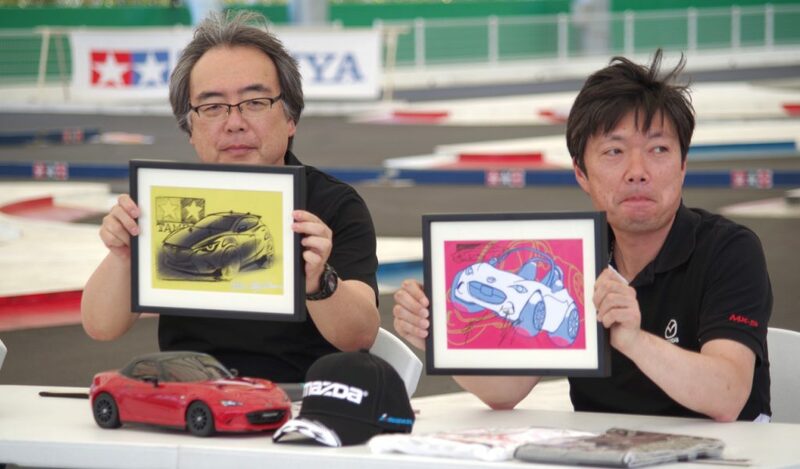 Mr. Nakayama (right picture) that Mr. Nakayama was also in charge of development of the NA Roadster said that ND Roadster became Tamiya ‘s 1/24 Sports Car Series Plastic Model and 1/10 RC Car, as was the case with NA. 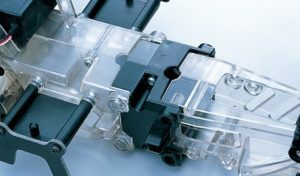 In M – 03 it was necessary to make the entire chassis unbalanced to open the gearbox (left in the photo), but in M ​​- 07 CONCEPT the access to the drive system became easier, in case of maintenance troubles or maintenance Also to be able to respond quickly (picture right). As Mr. Noma said, the conventional “M chassis” had poor maintainability of the drive system. 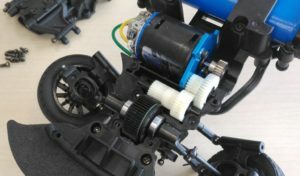 This point was also improved with M – 07 CONCEPT, it was possible to fully open the gearbox just by removing just 8 screws, and the maintainability of the drive system including the differential greatly improved. M – 07 What is the run of CONCEPT? M – 07 CONCEPT was created based on the concept that “anyone can easily run”. 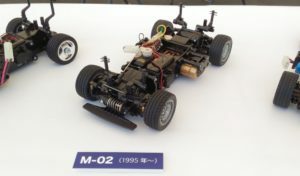 Mr. Maezaki said, “The conventional model was difficult to maneuver because the capacity of the chassis was small, but I was able to realize that the car capacity increased since I first ran M-07. 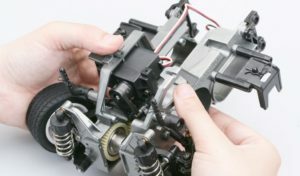 If this is the case, I think that any level of users will be able to operate with confidence, “said Mr. Noma, who also has abundant experiences of RC cars” also, it was easy for the high side (falling) when using Demio’s body with M – 05 However, M – 07 was totally different (although the body was the same), although M – 05 is a good chassis, running with M – 07 can not go back anymore, “he also praised the run. Mr. Noma and Mr. Nakayama who are driving M-07 CONCEPT. That facial expression is serious! From the veteran to the beginner, it confirmed the development concept of M – 07 CONCEPT that anyone can run easily. 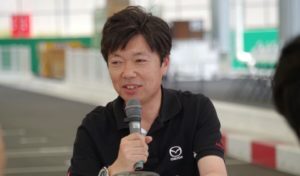 At this briefing session, it was also announced that the “MAZDA Championship” sponsored by Mazda will be held at the “Tamiya Grand Prix All-Japan Championship” to be held every summer. “Tamiya Grand Prix All-Japan Championship” held in Hokkaido from the north to the south to Kyushu, the nationwide venue nationwide is a national competition that appointed the representative right to the “Tamiya Grand Prix World Champion Decision Battle” to be held in Shizuoka every November. 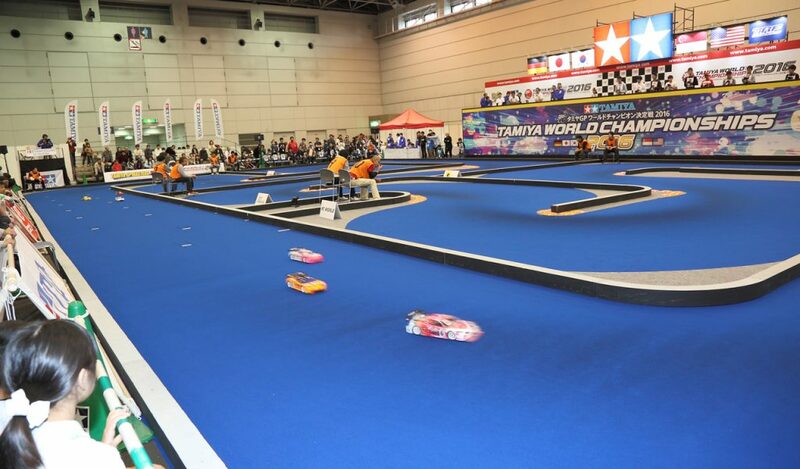 “Tamiya Grand Prix World Champion Decision Battle” to be held in November every year is the stage that Tamiya RC car fan admires. The photo looks like last year. 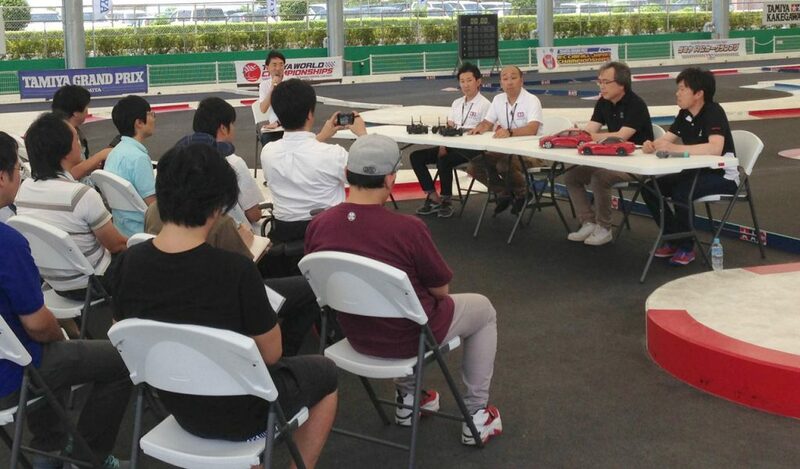 From this “Tamiya Grand Prix World Champion Decision Battle” that experts who won the preliminary contests in the US, Europe and Asia regions in addition to the winners of domestic competitions are pushing ahead, many RC car · professional drivers are born , Some players have climbed to the world championship. 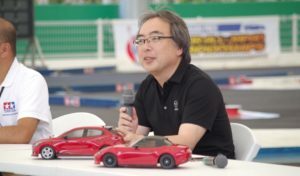 “MAZDA Championship” is set as one of five classes to be held at the “Tamiya Grand Prix All Japan Championship”, and the body that can be used is limited to “Mazda Roadster” or “Mazda Demio”. Because affordable things are designated for power sources such as motors and batteries, it is attractive that anyone can easily participate. Of course, entry with M – 07 CONCEPT is also possible. “MAZDA Championship” Cap and illustration board sent to the winner. Roadster is Mr. Nakayama, Demio is handwritten by Mr. Yanagisawa who is the chief designer, each with autographs. 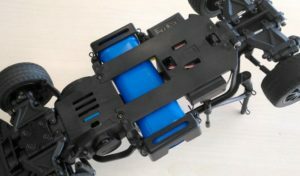 By the way, it seems that Demio is an illustration of Tamiya ‘s RC car, not a real car, and it is drawn tightly to the body mount. Also, it is also the appeal of this competition that Mazda will present luxury prizes only for “MAZDA Championship” to the winners at each event. 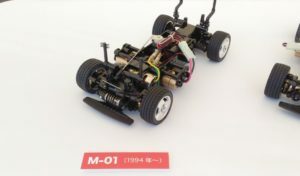 Why do not you join in the M – 07 CONCEPT by all beginners of the RC car too? ※ Detailed schedule etc. of each event can be confirmed on the Tamiya website. This entry was posted in Event Report, Future Releases, Media, Tamiya Company on June 26, 2017 by admin. 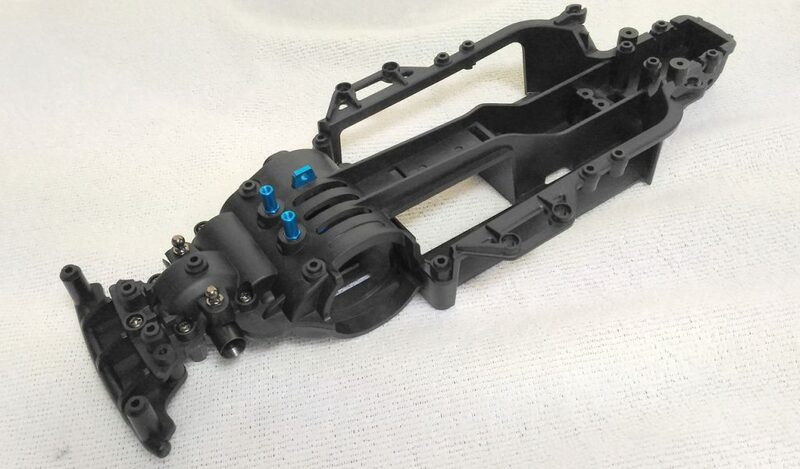 I get it but Tamiya got to fully take advantage of this new chassis design by creating an all-in-one chassis i.e. : with a few parts, a racer can switch from MF to MR. This M07 Concept has that swapability written on it. I wonder why Tamiya didn’t explore? I mean why do you want MF racers have the advantage and leave the MR racer with older chassis (like REALLY OLD) with major disadvantage (chassis tuning, suspension tuning, battery placement, Lipo ready etc) only to have say M08 as MR version of M07 two years down the line for example. Why not now, Tamiya?